We are pleased to invite you to a tasting focused on the Croatina grape that will take place in Pavia on Friday, March 1st 2019. 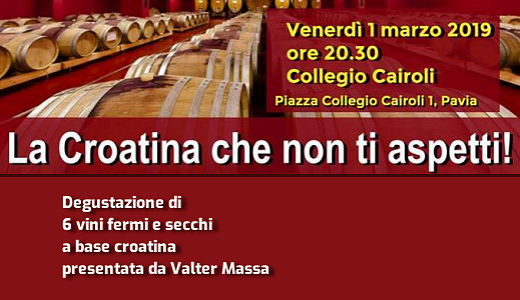 The tasting, hosted by Cairoli College and led by famous winegrower Valter Massa, will include 6 Croatina-based still and dry wines by the following wineries: Bisi, F.lli Agnes, Martilde, Picchioni, Pietro Torti and Vercesi del Castellazzo. After the tasting 2 different risotto will be served. The service at the tasting will be free provided by AIS Pavia. The event is part of a crowdfunding project of the University of Pavia to support a scientific research on the effects of psychoactive drugs on individuals from a pharmacogenetic point of view. Reservation is required and must be done by Thursday, February 28th: please call +39.0382.984007 (Giuseppina Gianesin) or send an email to gianesin@unipv.it. Information and reservations: +39.0382.984007 (Giuseppina Gianesin) or gianesin@unipv.it.